This is a teaser trailer for The Nun. 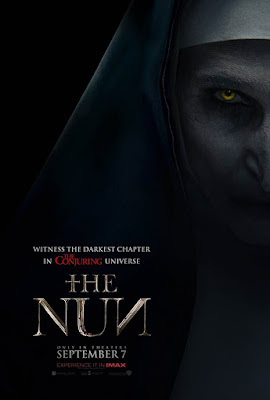 It is a spinoff of The Conjuring 2, featuring the demonic nun character from that film. It was directed by Corin Hardy (The Hallow), written by James Wan (directed both Conjuring movies) and Gary Dauberman (IT, Annabelle), and produced by Wan, and Peter Safran (produced both Conjuring films). It stars Demian Bechir, Taissa Farmiga, Bonnie Aarons, and Charlotte Hope. The Nun is scheduled to be released on Friday July 13, 2018. Check out the synopsis and trailer below. "A priest named Father Burke is sent to Romania to investigate the mysterious death of a nun."